Visiting with the Ancestors: The Blackfoot Shirts Project led by curatorial and conservation staff at the Pitt Rivers Museum, University of Oxford and in collaboration with the University of Aberdeen, involved the development of mutually beneficial collaborations with Blackfoot First Nations in Canada. 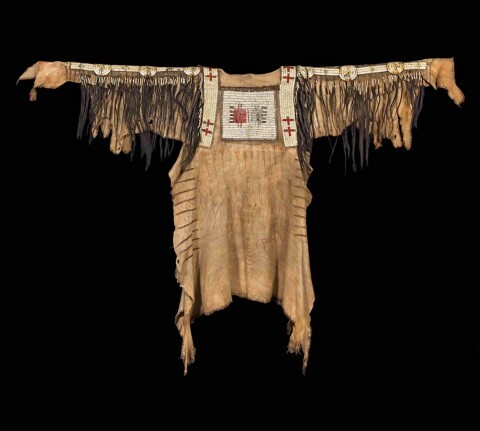 Historic hide shirts from the Museum’s collections were loaned to museums within traditional Blackfoot territory, where elders, ceremonialists, teachers and youth were able to handle them under supervision, prompting participants to share traditional knowledge, arts, rituals and social practice with each other. This project contributed to the survival of endangered arts and cultural heritage, strengthened social relationships and Blackfoot identity and contributed to social healing after colonial trauma.